Greek online stores are unnecessarily preparing for profits: they do not try to contact proactively creditworthy customers who put the goods into the basket and therefore the purchase is not completed. Additionally, prospective customers know nothing because the stores do not investigate customer behavior during the purchase process. Genesys conducted an experiment in the Greek Market with 119 of the top online or hybrid retailers in Greece by registering on their websites, giving an email and phone number, shopping for approximately 220, 00 Euros worth of merchandise, and then abandoning the shopping carts. In this study, only 14% of retailers communicated within 24 hours and 86% of retailers failed to communicate even within a one-week window. 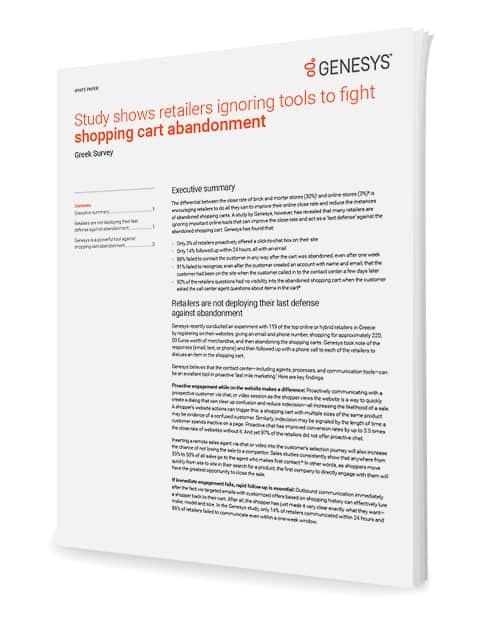 Far less than half (8%) of the retailers questioned told the customer that they had no visibility into the abandoned shopping cart and so they couldn’t answer any questions or clarify any product specifications that would help conclude the sale. Only 14% of the stores offered the customer an active chat. If you are interested in detailed results and wish to learn how to get customers to complete online purchases or how to sell them more, download the enclosed study.